Ninety percent of consumers use search engines to find what they need in their local market, according to a consumer tracking study by BIA/Kelsey, and a study by Hinge Marketing predicts 80 percent of them will view your website to help inform their choice. 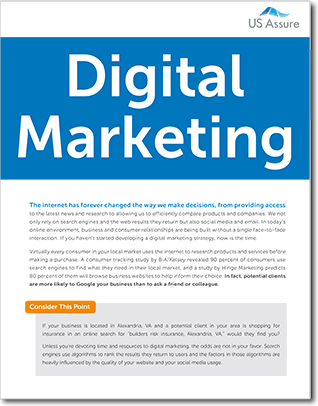 Where does that leave your business when consumers are searching online? Complete the form to download Digital Marketing for Insurance Professionals and start developing your digital marketing strategy.